The self-designation of the coastal Chukchis is ankalyn, "coastal man", and of the tundra Chukchis, chavchu, "reindeer man". The name lygoravetlyan - "true, genuine man" covers both tribes. In the 1920s, the name was adapted as the official name Luorawetlan. In practical linguistic usage, the name chukchi, a Russian adaption of the name chavchu, has been widespread since the 17th century. It has been supported by Russian geographical names (Chukotka, Chukotsky poluostrov, Chukotskoye more) and since World War II the name Chukchi has been predominant in official use. Nowadays, it is in overwhelming use by the people themselves. The earliest written records of the Chukchis date back to 1755 when they were mentioned in a travel report by the Russian explorer S. Krasheninnikov. The Chukchis live in the extreme northeastern part of Siberia, in the area between the Chukchi and Bering Seas, which extends from the vicinity of the mouth of the River Indigirka to the Bering Straits in the east, and from the Arctic Ocean to the Kamchatkan Peninsula in the south. Administratively, they belong to the Chukchi Autonomous Okrug of the Russian Federation (Magadan Region) and Koryak Autonomous Okrug. The Chukchi Peninsula belongs to the permafrost zone of the tundra, and the Chukchi Upland is predominantly mountain tundra, partly frozen desert. Anthropologically the Chukchis belong to the North Asian race. They are short people with a swarthy complexion and a stocky build. Their faces are very broad and flat, the cheekbones are prominent and the narrow eyes have a pronounced Mongolian fold. The eyes and hair are dark, and the hair is straight and stiff. They have no growth of beard. The Chukchi language, together with the Koryak and Itelmen languages, belongs to the Chukchi-Kamchatkan group of Paleo-Asiatic languages. The closest related language is Koryak. Despite the huge area of distribution, dialectical differences are slight. The Chukchi language is divided into several dialects: the coastal or eastern dialect, the tundra or western dialect, the Enmylin dialect, (characterized by the influence of the Kerek language), and the Nunligran and Khatyrka (with Koryak influences). The categorization of dialects is still ongoing. In structure, Chukchi is an incorporate language. The Paleo-Asiatic languages are believed to be primordially related to the languages of the American Indians. When a land connection existed, before the rift that is the present-day Bering Straits, the ancestors of the Indians migrated to what is now America. This hypothesis has many supporters. The kinship of Chukchi with the Eskimo-Aleut languages has not yet been confirmed. A curious peculiarity of the Chukchi language is its different pronunciation by men and women. The women's language lacks the r-sound, they pronounce ts instead. The men's pronunciation of the r is regarded as unsuitable for women. The Chukchis have had linguistic contacts with all their neighbouring peoples. Areas traditionally central to the Chukchi lifestyle are rich in native vocabulary (for example, 'reindeer' as a name exists in many forms depending on the age, colour, gender or nature of the animal). The layers of loan words form a clear pattern: the older loans come from the Eskimo language (predominantly in the fields of fishing and seafaring). There are fewer loans from the Koryak, Yakut and Yukaghir languages. Russian loan-words appear from the 1930s on. A newly introduced written language urgently needed its own words for evolving socio-political, cultural and technical notions. A part of them were borrowed from Russian, the rest formed from native linguistic material. Later, Russian gained unlimited supremacy. Russian spread, and its prestige increased due to schooling, mass media, business and other everyday exposure. In the 1960s, there was a boom in mixed marriages which eliminated the Chukchi language from domestic use far more efficiently than any official policy. 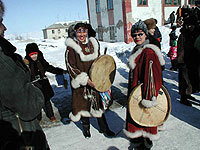 The Chukchis are one of the aboriginal peoples of Siberia. Chukotka is believed to have been inhabited for about the last 7,000 years, although the ancestors of the Chukchis migrated there from the south somewhat later. They assimilated the local tribes and subsequently expanded their habitation (mainly at the expense of Eskimos, but also of Yukaghirs). Life for the Chukchis means privation and cold and a constant struggle for existence, but also freedom and proud self-sufficiency. In 1642, a Cossack named Ivan Yerastov reached the River Alazeya, and in 1649 the fortified settlement of Anadyr was founded. However, conquering the land of the Chukchis was a slow and laborious task for the Russians. The Chukchis defended themselves bravely. Prisoners of war killed each other, preferring death to slavery. By the 1730s the land was conquered, but not the people. Construction expenses for the Anadyr fortress were, for the period 1710 to 1764, 1,381,000 roubles. In 1778 the Russians thought it preferable to conclude a peace treaty with the Chukchis. The treaty held and the forcible gathering of tribute was abandoned. If the Russians had not yielded, probably all the wayward Chukchis would have crossed over to the American side of the Straits. Abandoning the fortified settlement of Anadyr helped appease the wrath of the Chukchis and gradually they began trading with the Russians. To inform foreign ships that the Chukchi Peninsula belonged to the Russian Empire, huge imperial coats-of-arms were sent to Chukotka and the Chukchis were ordered to fasten them onto trees along the coast. Alas, the lords in St. Petersburg had no idea that Chukotka was a region with little vegetation and no trees. Later the Russians tried to expand their influence under the cover of trade. In 1788, for example, they began organizing fairs in Anyui, to carry on the old traditions of barter trade. The Chukchis were lured, with the help of bribes, gifts and vodka, to become reconciled to imperial rule and their paying of tributes. Sources from 1822 indicate that the Chukchis were left to pay tributes at their own discretion. However, by the 19th century the Chukchis were known to be very fond of vodka. Primitive races have no biological resistance to alcohol, and fondness can rapidly lead to addiction. Chukchis are traditionally nomadic reindeer herders. They have always been more active than their neighbours. The coastal Chukchis settled on primeval Eskimo land; the Eskimos, Itelmens, Evens, Kereks etc, have long been accustomed to communicating with Chukchis in the Chukchi language -- many of them have even become Chukchis themselves. At the same time, Chukotka has served as some kind of a contact zone. The reindeer breeders traded their reindeer skins, meat and furs for fish, train-oil and walrus skins from the coastal people. There has always been a lively The preservation of Chukchi folk culture and the nation's capability for reproduction is at peril. Children are brought up at Russian boarding-schools, maintained by the state, and allowed to visit their parents only during school holidays. Parents have been deprived of a chance to take care of their children, and to pass on to them their experience and customs. The environment is favourable only to the propagation of the Russian language - it reigns in stores, in hospitals and offices. Since the 1960s, and its boom of mixed marriages, Russian has even invaded domestic life. One of the reasons why Chukchi women so frequently married Russian men may have been that they thought their chances of bearing healthy children greater with a Russian partner. Recently, the Chukchis have begun to revive as a nation. National issues and problems that have so far been prohibited from discussion have become topical. The Chukchis once sunk in total apathy in their polluted Russian language environment, are beginning to hope again.